Or waxing, or threading etc…If you want to see this through you’ll have to inject a little laissez-faire into your brow routine. Get used to it. This is not a one-week operation. It can take at least several months for the full hair growth cycle of your eyebrow hairs to complete itself, so hold out. For as long as you can, or at least until three months. At most, this can take half a year. 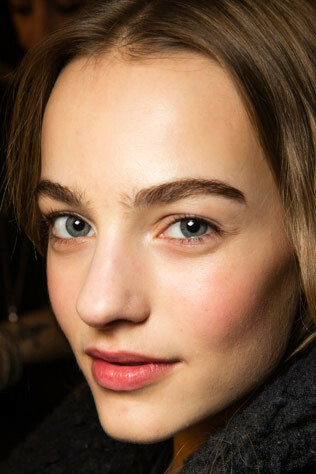 Make peace with the fact that your eyebrows are not going to look their best for a little while. Stray hairs will come in around the outer ends, above the eyebrow and around the eyelid area. But, and here’s the part where you’re allowed to do something, try using a brow gel to smooth down hairs that come in at an odd angle. Benefit Gimme Brow has a good level of hold to pin down unruly individuals. If the stray is alone in an obvious area, a heavy-duty concealer will help. Try M.A.C Studio Finish Concealer. The good, or great, news is: at the three-month mark, tweezing is okay. Though keep this strictly to the lid an outer brow area. This is said to actually stimulate hair growth, above and around where you’re tweezing, which means in the brow itself. While you wait it out, you can help along your hairs using a product that promotes hair growth. Latisse is an eyelash growing serum that many swear works on eyebrows and is said to stimulate hair growth and also promote thicker, darker hairs. Keep at the above for up to a year. Add to your handbag, desk drawer or beauty cabinet, the aforementioned eyebrow gel, or a clear mascara and train your eyebrow hairs to grow in the right direction. Daily Mail – Time to anti-age your eyelashes!